Hey dudes and dudettes, It's about 35 degrees (42 with the humidex) in Ottawa today, the kind of day where the only cooking you're doing is in your clothes. Where the person with the pool wins. On such a day the last thing you want to do is cook, even on the grill. It's a day of salad and cold food. Now, you've got a lady/gentleman friend coming over to... I don't know... hang out in your freezer? Well, you need to serve something tasty, right? Well, with that in mind, here are a few ideas for days like today. All these meals should be served with a fresh baguette, loaf of sourdough or ciabatta buns. Or whatever bread looks tastiest at the bakery... If you need to top the bread with anything, I suggest Boursin cheese - Garlic & Fine Herbs. Dead easy to make and tasty. There are a number of variations, but traditionally it's a combo of cucumbers, red onion, tomatoes, olives, green peppers and feta cheese. In this version, I'm replacing the green peppers with red, because of you're anything like me, raw green peppers are the LAST thing you want to eat on a date! Also, omit the red onion if you wish. Raw onion isn't exactly what your breath needs when trying to seduce, and I also find it can overpower the other flavours. NOTE: I've also added cut up pieces of Genoa salami to the salad for extra flavour (don't do this if your date is a vegetarian!). 2) Saffron Gazpacho I'm cheating a bit with this one, it's actually a recipe a lady friend made and she got it from the following site: http://vegweb.com/index.php?topic=10479.msg73108#msg73108. I'm reprinting it anyway. Now, gazpacho is cold soup, a concept which often hurts the brain of less adventurous diners. But it's delicious and amazingly refreshing on really hot days. You can find saffron at most gourmet grocers or produce stores. It's not cheap but a little goes a long way and it adds an earthy flavour to most foods that's quite interesting. - Rub the saffron threads between your palms into a small bowl. Add the broth powder, onion, and raw garlic (if using). Pour the boiling water on top and stir. Cover and let steep for 5 minutes. - In a food processor or blender, puree the saffron mixture, plum tomatoes, roasted garlic (if using), cucumber, and roasted pepper. Transfer to a glass storage container and stir in vinegar, and salt and pepper to taste. (The gazpacho should have a slightly acidic edge.) Cover and chill before serving. Garnish with chives. From Wikipedia: Antipasto (plural antipasti), means "before the meal" and is the traditional first course of a formal Italian meal. 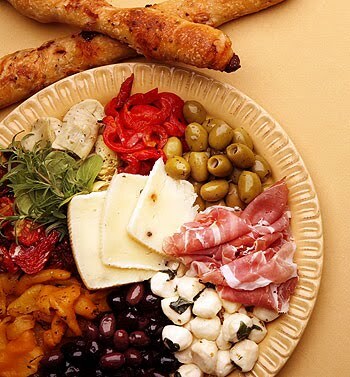 An antipasto-style plate makes for a great light dinner or lunch and is quite good for sharing. the best part? You make NOTHING; it's all buy-and-assemble. Well, mostly. Listed are some of the items you'll find on a traditional antipasto plate. All can be found at Italian grocers and usually the supermarket. ...and what ever else you feel like! As long as it's Mediterranean. Basically take all ingredients, drain excess liquid from the marinated/pickled items, pit the olives if necessary and arrange it all nicely on a plate. You might want to roll up sliced meats for ease of handling. Serve with chilled wine or some other cool drink! Enjoy!